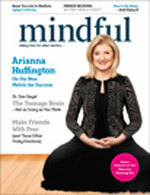 "...Architect Paul Harrison was inspired by his own experience of mindfulness to produce The Mindfulness Movie. While music and special effects sometimes offset its solid messages, we get a good look at what contemplative neuroscience is revealing about the brain, and where mindful techniques are being used in education..."
"I have had the privilege of working with Paul Harrison for the past 6 months on developing a "Mindfulness" workshop for Corporate Leaders in GE. Paul presented at our "Mindfulness in the Corporate World" pilot class."